While almost every university and college wants to try adding competency-based education (CBE) to their higher education offerings, putting a budget together for those efforts may be mystifying. After all, if the course isn't predicated on "credit hours," how do you price tuition? Likewise, how do you estimate course design expenses? Those are the kinds of questions a new freely available cost tool is designed to help address. 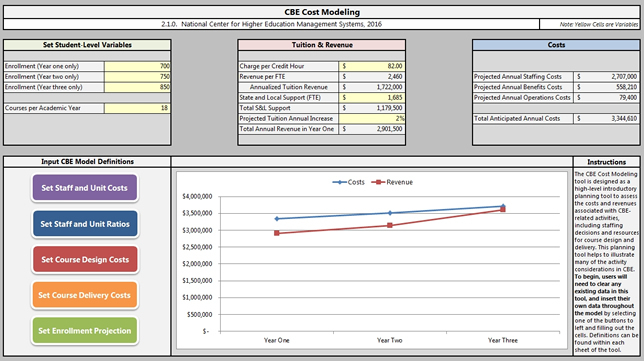 The National Center for Higher Education Management Systems (NCHEM) specifically designed the Excel spreadsheet to assist institutions in planning out costs and revenues associated with CBE-related activities, including staffing decisions and resources for course design and delivery. NCHEM is a private, non-profit focused on improving strategic decision making in colleges and universities, particularly for policymakers at the state and institutional level. Worksheets in the tool explore staff and unit costs, course design costs, enrollment projections and related variables. The results allow decision makers to "unpack" activities, costs and revenue related to the startup and maintenance of a CBE program. Worksheets in the tool explore staff and unit costs, course design costs, enrollment projections and related variables. The work was supported by the Lumina Foundation. Users can download the cost model in Microsoft Excel format as a blank worksheet and as a sample.